….to create a conscious menu and positive environment that supports healthy choices and sustainable practices, for both people and planet. 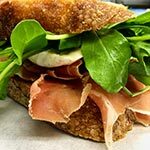 Mountain High Sandwich Co. is an all natural gourmet deli, emphasizing fresh healthy organic whole foods and a casual friendly environment in Lake Tahoe. The menu is consciously created, using carefully sourced high quality ingredients. Our menu accommodates healthy lifestyles and food sensitivities, featuring vegetarian, vegan and gluten-free items. All of our produce is organic. Some is also local and changes with the seasons. Many of our other ingredients are also organic including seeds, nuts, quinoa, chickpeas, beans, tofu, tempeh, gluten-free oats, agave, cacao powder/nibs, coconut oil/milk/shreds and organic free-range eggs. The meats we serve are thoughtfully raised and natural. Menu items include: unique sandwiches, thoughtful salads, wholesome soups, quick breakfast, freshly prepared grab-and-go selections and rotating local kombucha and beers on tap. Our disposable packaging and service ware are made from renewable plant based materials that contain no plastic and are compostable and/or biodegradable. Including grab-and-go containers, salad bowls, boxes, soup cups, utensils, bags, drink cups, lids and straws. Thank you to the local businesses who contribute to our menu. We appreciate you! and all others… We appreciate you!